How to edit your workflow stages. 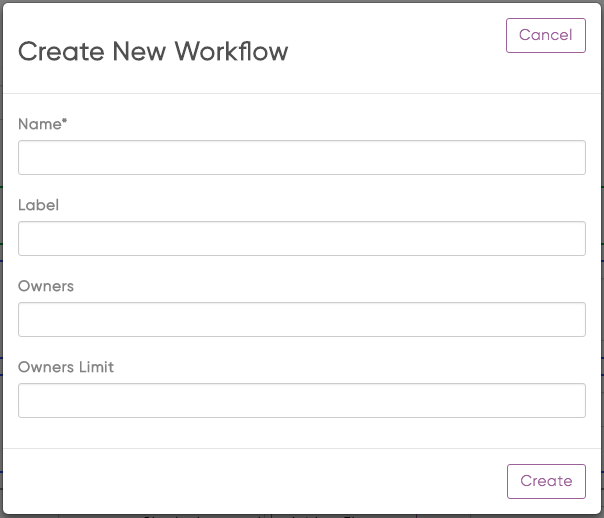 To open the Workflows Editor, go to Settings → Workflows → Workflow Stages. 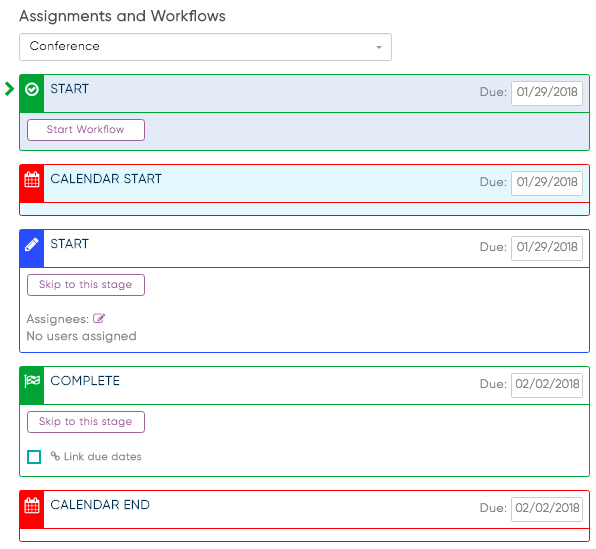 There are two main action items available to the workflow stages. Creating a new workflow, and editing the select workflow (as shown in the drop-down menu). To create a new workflow, simply click the +Create button. Here you can add the new name you want to use for this workflow, as well as label for internal use. You can also set the default owners and or/limit by selecting in each text box. For the Owners, this will limit to a specific user(s) so that when an item is created using this workflow the default owner will be a specific user(s). For the Owners Limit, this will pull a list of users with a specific role or group of users, as an example you'd have the role "Admin" as the default Owners Limit so every time a new item is created you can only choose from the Admin list. Once you've filled this information out, you can save the workflow. If you click the Edit button, a pop-up window will open for you to edit the settings for the currently selected workflow. Here you can edit the name, label, owners, and owners limit. When ready, you can hit 'Save' to save the changes or 'Cancel' to exit without saving, as well as 'Delete' the workflow if desired. Assign Default: The users listed here are assigned to that particular stage in the workflow. If the stage is set to Single Approval then only one of those users needs to approve (or skip the stage) to move the next stage in the workflow. If the stage is set to Multi-Approval then all assigned users need to approve (or skip the stage) before moving to the next stage in the workflow. If the stage is a Working stage then the assigned User will set the stage to Completed to move through the next stage. Assign Limit: The users listed here are the only users that can be assigned to the stage. This is also to provide a dropdown list of the people who might be involved in the approvals and ensures the stages are locked. To add a new stage in the workflow, simply click the '+Add a New Stage' button found in the bottom of each workflow being worked on. Clicking the 'View More' allows you to edit the xisting stage's settings. Keep in mind that this option is not available to Workflow Start, Calendar Start and Calendar End stages of the workflow. Deleting a stage is simple. Just click the 'Delete' button on the right hand-side of the stage you wish to delete. A stretch event allows you to stretch a calendar item to display across multiple days. When you're creating a Calendar Item, you can set the 'Calendar Start' and 'Calendar End' to enable the stretch event feature. These pointers will be the start and end of where the item will stretch. Here you will see that the calendar start is set for January 29 2018; whereas the calendar end is set for February 2 2018. After saving this specific calendar item, this is how this stretch-event will look like in your calendar.